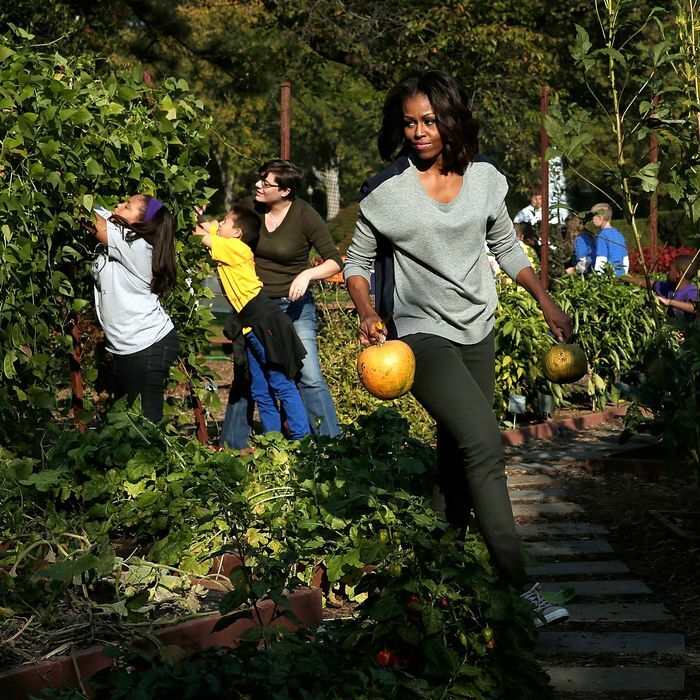 What Will Become of Michelle Obama’s Garden? What Will Become of Michelle Obama’s Garden in a Trump Administration? Donald Trump has made no secret of his desire to take a sledgehammer to every one of President Obama’s signature polices once he moves into the White House, in January. What’s less clear is how the president-elect feels about Michelle Obama’s achievements, which include a 1,100-square-foot vegetable garden on the White House’s South Lawn that has become the object of derision among some conservative commentators. The garden, like all gardens and all food that comes from them, has made Rush Limbaugh “gag” for years. On Thursday, Ann Coulter presented her idea for what Trump should do with the plot, which provides food for the Obama family and for a local soup kitchen. This isn’t just partisan bluster. President Obama is so worried about his wife’s crops he brought up their potential destruction with radio host Tom Joyner earlier this week. “I guarantee you they’ll dig up Michelle’s garden,” he said to laughter. “You think I’m joking?” he said, clearly not joking. It turns out, the First Lady has actually taken a few steps to make destroying the garden a little harder than hiring a guy with a bulldozer. In October, she unveiled a renovation to the garden, which included “cement, stone and steel to make it a more permanent fixture on the South Lawn,” Politico reported at the time. She also secured $2.5 million in private funding to defray taxpayer cost, removing at least one of the arguments for eliminating the garden in the future. Earlier this week, the New York Post reported that the First Lady is pushing the president to issue an executive order protecting the garden after he leaves office. Students from around the country that participate in #LetsMove programs joined the First Lady to help her harvest last week, including harvesting her favorite fall vegetable: sweet potatoes. Of course, even if the President did issue such an order, Trump could overturn it. So the only thing standing in the way of the garden’s destruction is some steel and the inevitable PR hit that would follow. Another thing working against the garden is that Trump eats like a 15-year-old. Unless someone quickly figures out a way to grow onion rings and burnt steaks, the president-elect is unlikely to feel much allegiance. But that doesn’t mean there’s no hope. The fast-food freak isn’t the only one moving into the White House next year. His wife, Melania, a model, will be there, too, and according to a GQ profile from April, she’s fond of eating “seven pieces of fruit a day.” That’s good news! Melania may want to keep the garden, though it’s easy to anticipate one change she’ll want. Just replace Michelle’s name with hers in the inscription below and the garden will likely live on.